Throw away any other recipes for healthy vegan brownies you’ve got right this very minute because you’re never going to need them ever again. These game-changing brownies are the most intensely chocolatey and unbelievably fudgy brownies in existence. Plus they’re totally flourless, gluten-free and loaded with protein. All for just 100 calories each. You’ve got to eat it to believe it! What do you do when you go round a new friend’s house for the first time and discover she lives on a farm pretty much bursting with fruit trees? Well, if you’re me, you run over to the avocado tree and look sorry for yourself telling her how much you love avocados but how super expensive they are so you never really buy them until she gives you a great big bag of them to take home. Then, when you’ve had avocado on toast for breakfast, lunch and dinner for a week, you decide you need to start being a bit more adventurous with your cooking and add them into your next batch of healthy vegan brownies before you turn insane from overdosing on avocado on toast. Before we take this any further, I’m going to tell you that these healthy vegan brownies are not for avocado haters. 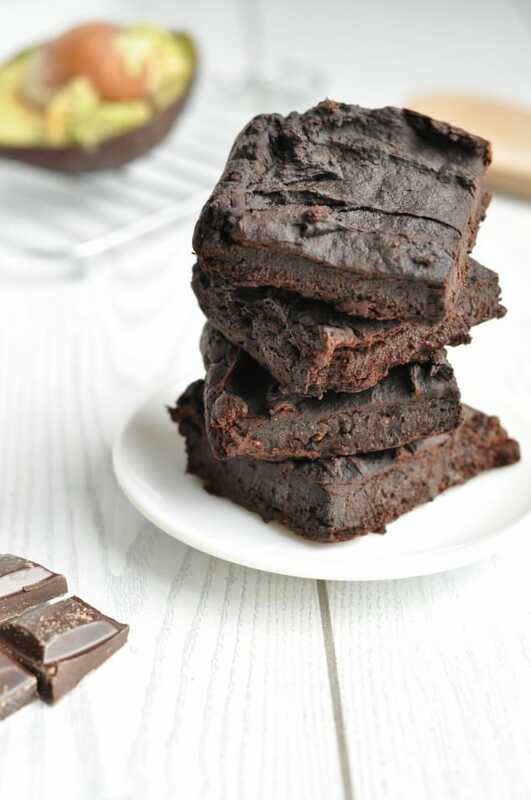 You totally can’t taste the black beans in this recipe (just like you can’t taste them in this healthy black bean brownie recipe or how you can’t taste the pumpkin in this one-bowl healthy pumpkin brownies recipe) but you can definitely taste the avocado. 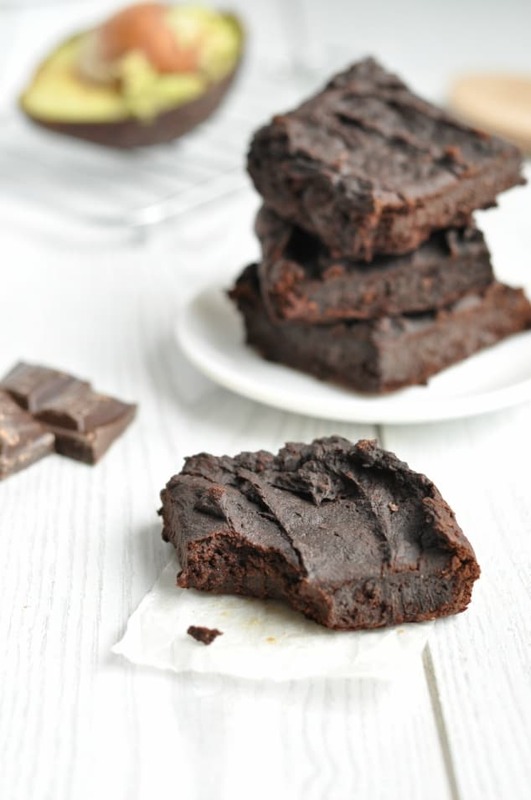 So if you’re not a fan, maybe try one of my other healthy brownie recipes. I’ve got so many there’s bound to be at least one you’ll fall head over heels in love with! But if you do like avocado (hello my new best friend!) then you’re in luck today. These are the most incredible healthy vegan brownies I’ve ever had. They taste so fudge-like and indulgent you’d never ever ever guess that they’re good for you or packed full of veggies. Did you know that beans count as veggies and one of your five a day? It’s true! But anyway, back to the super powers of these healthy vegan brownies. So not only are they beyond delicious and loaded with veggies, but they’re also packed with protein and fiber so they genuinely fill you up. Not bad for a chocolate brownie that comes in at just 100 calories, right? 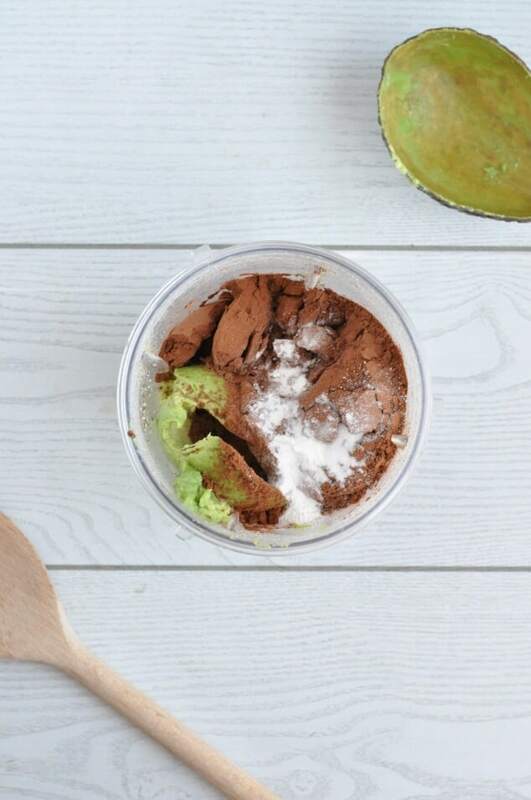 I make these healthy vegan brownies with one of my favourite kitchen products of all time – my NutriBullet. All you’ve got to do is pop all the ingredients in and turn it on to mix the batter. That’s honestly how simple it is. Even if you’re an alien who’s never stepped foot inside a kitchen before, you can totally make these. One other little tool I find super helpful to make these healthy brownies is my multi-size cake pan. You can use it to make cakes anywhere from 1″ x 1″ up to 10″ x 10″ by moving the dividers. You can make a full batch of these healthy vegan brownies by setting both dividers to 8″ or make a half batch by setting them to 5″. It’s so awesome I never bother using any other cake pan. 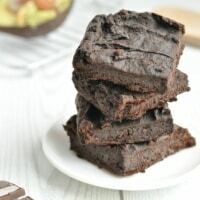 Super fudgy and packed full of nutritious protein, these healthy vegan black bean brownies are the perfect healthy snack to enjoy before or after your workout, or just because you deserve a little treat! Preheat the oven to 350F/175C and line an 8"x8" baking tray with parchment paper. Grind the chia seeds into a powder in your NutriBullet or other high-speed blender and pour in the water. Leave to sit for 10 minutes to thicken. Add the rest of the ingredients into the NutriBullet and blend until you've got a smooth batter. Pour the batter into the lined baking tray and bake for 20 minutes, until the tops of the brownies are just starting to dry out and become firm. Transfer the brownies to a wire rack and leave to cool to room temperature for around 30 minutes before chilling in the fridge for at least 4 hours then slicing into 9 and serving. These brownies are definitely best eaten cold straight from the fridge. If you slice the brownies up into individual servings and wrap them in plastic wrap, they will keep perfectly well in the fridge for up to one week or in the freezer of up to six months. You can also halve the recipe, bake it in a 5"x5" tin for 15 minutes and slice into 4 brownies if you want a smaller batch. I know, right?! And thanks so much for the compliment! You’ve definitely got to try baking with black beans – they’re amazing! I know, right?! It’s about time I paid her another visit so I can make some more brownies! Wow! Your brownies looks so deep and dark in the chocolate world! I’m trying this recipe soon. Love the avocado included! Thanks so much! They really are the deepest, darkest, chocolatiest brownies I’ve ever had. Wow do those look good! Perfection! Thanks so much, Linda. They really are! Oh my! 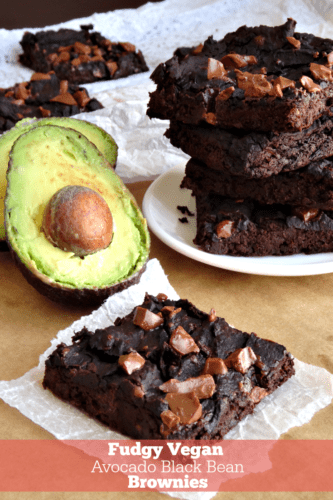 This is hands-down the best, most interesting brownie recipe I’ve ever come across and I truly cannot wait to try this – avocado, black bean and chia! Dayumn! I’ll take that as a compliment, Tina! 😀 Avocado, black beans and chia seeds don’t sound like they’d make the best brownies ever, but they really do! What is that light Brown stuff on Top? Can I use ground flax to replace the chia? Hi Marie! SO sorry for the late reply! Yes, you can definitely use ground flax to replace the chia seeds. What else can I use to substitute for chia seeds? Hi Lynne! If you want to keep the brownies vegan, you can substitute ground flax seed. If the brownies don’t need to be vegan, you can substitute 1 medium size egg and omit the milk.